Gartner has released smartphone sales statistics for Q3, 2011 and it says that Symbian smartphones in the third quarter are down to 19 million from last year’s total of 29 million. 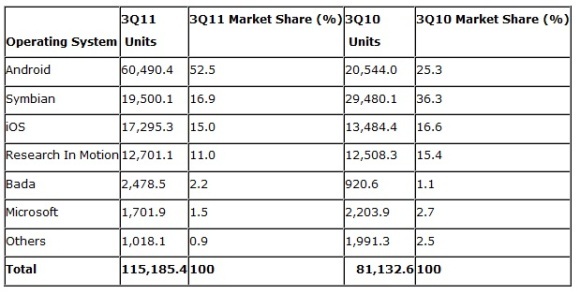 However, the sales are still higher than what Apple’s iOS devices managed for Q3 2011 and the leader was obviously Google’s Android with just over 60 million in the quarter. The upcoming quarter is going to be very crucial for Nokia as the company has been losing the market share since the beginning of this year. With new upgraded Symbian devices not leaving a huge impression on consumers, Nokia can only hope that their new investment in Microsoft can change some numbers for the once king of smartphones. Nokia will now have two OS under its smartphone range, but will that be enough to maintaing the spot in the market share? Symbian has already slipped from a 36.3% market share to 16.9% since last year and iOS closely following it at 15%. What is going to be Symbian’s fate, we’ll have to wait and watch. You can check out the full press release over here.